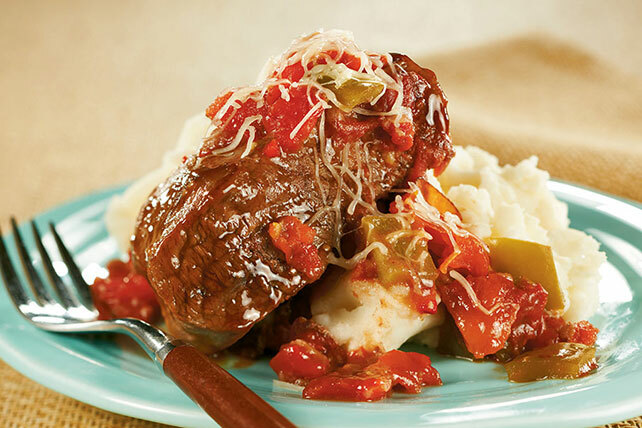 Throw the fixings in the slow cooker in the morning, then enjoy a steak-and-peppers main dish simmering in a tomato-based sauce for dinner. Heat dressing in large nonstick skillet on medium-high heat. Meanwhile, coat meat with flour; gently shake off excess flour. Add meat to skillet; cook 2 to 3 min. on each side or until evenly browned on both sides. Remove from heat. Combine tomato paste, tomatoes and broth in slow cooker. Add meat and peppers; cover with lid. Cook on LOW 8 to 10 hours (or on HIGH 3 to 4 hours). Serve meat mixture over potatoes; top with cheese.